If you are a blogger or web site owner, you already know about page rank update. Page rank of a website show the value of a web page in the eyes of Google. This was a primary factor of website’s ranking in search results in early days. Now Google has more than thousands factors to rank a website but page rank still shows the importance of the web page. Advertisers always consider better page rank of a website before starting their advertising campaign on that website. This is the reason why web masters wait for Google Page Rank update. In this post, we will see what is page rank and how it works. 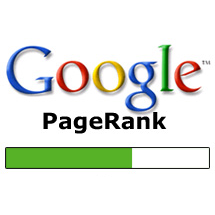 Page Rank is the algorithm used by Google and was named after Larry page. This algorithm analyse the all backlinks of a web page, assign a numerical weight to each backlink and then calculate the page rank of that web page. Google Page rank varies from 0-10. Here, Google Only consider the dofollow backlinks. Nofollow backlinks are not counted by Google for calculating page rank. If a web page has Google Page rank 0, it has no value in Google’s eyes. Web pages with page rank 10 are most valuable according to Google. Google never reveals the actual algorithm but we have a small idea of how the algorithm works. In other words we can say that PageRank value for a web page u is dependent on the PageRank values for each web page v contained in the set Bu (the set containing all pages linking to page u), divided by the number L(v) of links from page v.
You can understand that the page rank of a webpage depends on the page rank of all incoming web pages. If your website has a link back with a high Page Rank website, you will more likely to get better page rank. If you do not want to go in deep, I am trying to say in simple words. Google Page rank relies on the voting factor. If a web page A link to a web page B with dofollow link, Google counts a vote for web page B from web page A. Now there are many other factors to count weightage of the this vote. In this way, Google counts the votes for all the page. Web page with maximum votes gets high Page rank. Google assign each web page a PageRank that can be a number ranging from 0 to 10. All web master and bloggers try to get higher page rank. The higher the number, better the page value. How to check the Page rank of a website? There are many ways to check the web page. Most trusted way is Google Toolbar. Google Toolbar indicates the page rank of the current page. If you do not have Google Tool bar, you can check the page rank from online tools link PR checker. In starting days of Google, Google Page Rank was the primary factor of website’s ranking in search results. But web site owners had started buying and selling links to get more backlinks to get higher page rank. Websites with high pagerank started selling links for money. So the quality of search results started falling. To stop these spams, Google added to many other factors over the years. In past few years, Google has rolled out many penalty algorithms too. So, it is hard to say if a website having good page rank will be ranked better on search results. I think page rank is now a minor factor while ranking a web page. Google has also removed the page rank section from Google’s web master tools. Google wants webmasters to concentrate on creating good quality website not on Page Rank. I have seen so many websites that has less page rank but ranked higher that many high page rank websites. If Google Give PageRank Less importance, Why People Care about this? As I mentioned in the last section, Google give Google Page Rank less importance while ranking web pages in search results. Google page rank still shows the value of the page. A web page with high Page rank is still a good quality page. So, advertisers still consider page rank a big factor along with traffic before buying ad space on a website. After Google Penguin update and other quality updates, Google can now differentiate between natural back link and paid backlink. Why Google Does not Update Page Rank daily? Google does not update page rank daily. If updates page rank in the interval of 3 months and 4 times in a year. The reason behind this is that Google wants people to concentrate on building the good quality web sites. If Google will update page rank daily, people will only try to get good quality backlinks. With the help of regular change analysis, SEO researchers will also be able to guess the actual working of page rank. So, Google updates the algorithm once in a 3 months. In general, Google update page rank in the first week of February, May, August ad November. This is the first week on May 2013. So, Google is about to push Google Page rank update for may 2013. It can come in next 3-4 days. Google has updated pagerank last time back in February 2013. At the time of writing the post, UseThisTip is on PageRank -1. I am also waiting for next Google Page Rank update of may 2013. I am also wishing all the bloggers and web master all the best for next Google PageRank Update. As I mentioned earlier that Google hates paid backlinks. So, you need to get natural links linking to your website. There are many so many trusted and safe linkbuilding methods that you can follow to get better page rank in next update. here are few ways. Share your views about Google Page Rank with us via comments.